I’ve been reading a lot lately. Like a lot – a lot. Different things. This cookbook for instance. I’m wholly determined to finish reading it word for word. Even if I’ve been saying that for 5 months now. Also, this one. It’s about kings and queens and dragons. I’m sort of a fantasy/sci-fi nut. Sometimes, when it’s really foggy out and you can barely see the trees, I envision myself straddled on a mare, cloak billowing behind me as I race through the thicket, leaves shattering beneath the hooves. Usually I’m chasing some sort of monstrosity in my fancy to relieve the world of hellions and other evils. It’s at this point where you’re probably looking at me with one of those “poor-lass-she-must’ve-bumped-her-head-one-too-many-times” kind of looks, a soft kind glean of sorry understanding brimming from your eyes. They say it was cement. I do not remember. What does all this have to do with corn and garlic and mayo and cheese? Nothing. Nada. Zilch. Nil. Naught. Goose egg (my favorite). But, it’s good (the corn, not the goose). And I like that it sticks in my teeth. Total date food fer sure. *Queso fresco is a Mexican soft cheese similar to feta. You can opt to use feta, goat, Cotija (another Mexican cheese), or any other blend you like. I’ve been known to interchange cheeses depending on my mood or whatever I happen to have laying around in my fridge. Grill the corn on either a gas grill, charcoal grill, broiler, or stove-top griddle until just charred on all sides. It doesn’t have to be perfect, just a few spots of color is fine. I like to cook my corn just barely, especially in the summer, so it still has a nice bite to it. This corn also works just as well if you would prefer to boil or steam it instead. Meanwhile, combine the mayonnaise and the garlic together. 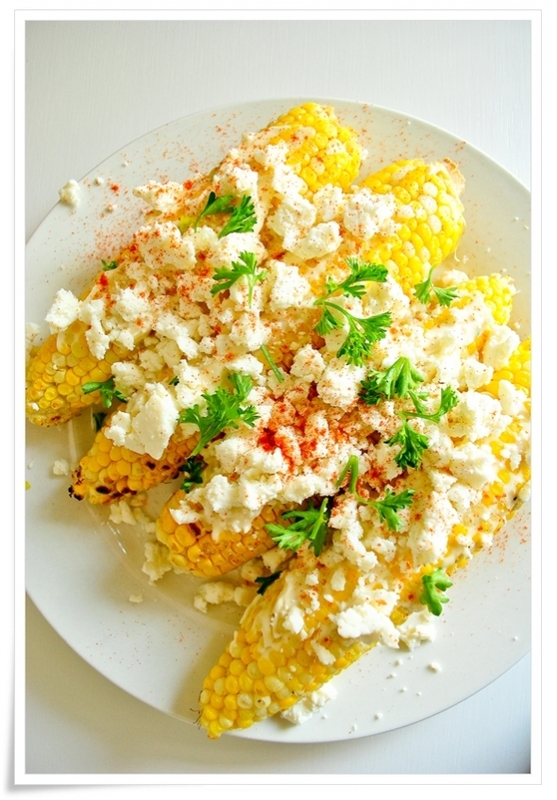 When the corn is done, slather liberally with the mayo-garlic spread and sprinkle with crumbled queso fresco, parsley, paprika (if desired), and serve with a side of lime for squeezing on top. BTW — Curly parsley is SO in now. Totally. Jessica - Delicious grilled corn! Love the garlicky mayo. Sabrina- The Tomato Tart - Oh, I love this so much. My father in law lives in Baja and my best friends used to live in San Diego, so we used to visit Mexico at least once a year. The first thing we’d do when we crossed the border was stop for corn. It was also our last stop. Now, I live in a primarily Latino neighborhood, so they sell street corn on carts right on my street. Lucky me! Perhaps, though I will have to make it myself with your mouth-watering recipe. Oh, and you’re right. Curly parsley is so it.